The device structure of flexible OLED display with MoS2-based backplane circuitry. (A) Schematic of high-mobility MoS2 TFT using an Al2O3 passivation layer. The Al2O3 passivation layer ensures n-type doping of not only the MoS2 channel region but also the contact region (top); ultrathin AM-OLED display using the high-performance MoS2-based backplane array (middle), which is attached as a display to human skin (bottom). (B) Specific layer structure of the ultrathin AM-OLED display. The thickness of the total display system is less than 7 μm. (C) Optical image of the assembled display on the flexible ultrathin polymer substrate; low bending stiffness of the display offers ultraflexibility. The inset image shows the flat state of the active-matrix display circuit. A team of researchers from Yonsei University, and Chung-Ang University, both in Korea, has developed a MoS2 transistor that can be used with bendable OLED displays. In their paper published on the open access site Science Advances, the group explains overcoming the problem of resistance between the MoS2 and a transistor's source and drain to create an operational bendable 6x6 pixel array. As phone makers seek ways to separate themselves from their competitors, research continues into the idea of a truly bendable product, which would include a bendable screen. There have been advances, but to date, there is still not a commercially available phone that can be bent like a piece of paper and shoved in a back pocket. In this new effort, the researchers report that they have overcome one of the hurdles involved in bringing a truly bendable phone, television or other screen device to market. One of the serious roadblocks to bendable devices is the resistance that occurs between MoS2 and a transistor's source and drain electrodes—it is just too high for practical use. To overcome this problem, the researchers placed the transistor between two layers of aluminum oxide instead of on a piece of silicon dioxide as has been traditionally done. They note that the interface between the two materials enhanced the flow of electrons into the semiconductor, which served to overcome the resistance encountered with other approaches. The result, they add, was a boost in charge carrier mobility. They note also that because of its smoothness, there were no places where charge could become trapped, which, they claim, improved mobility even more. 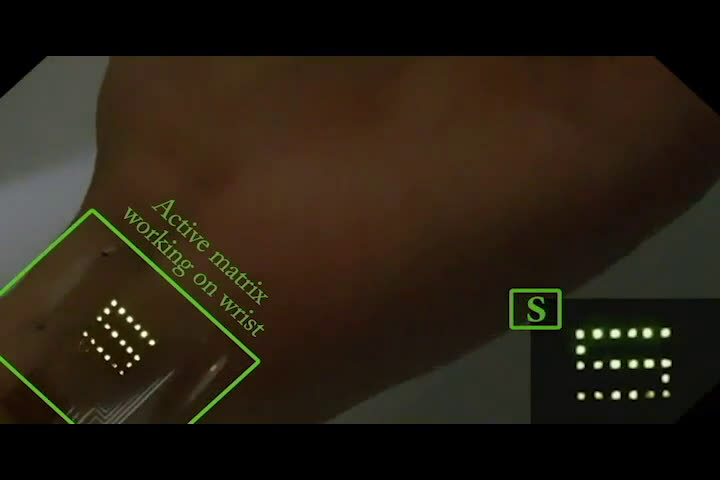 The researchers demonstrated their idea by creating a 6x6 pixel-array display device that could be affixed to the skin like a Band-Aid—it was capable of displaying numbers, like an old-fashioned calculator. The team reports that the bendable device (which was just seven micrometers thick) could withstand bending to a radius of one millimeter repeatedly. More research is required to find out if the technique can be scaled for use in a high-resolution device, and if so, if it can be done in an economical way. Atomically thin molybdenum disulfide (MoS2) has been extensively investigated in semiconductor electronics but has not been applied in a backplane circuitry of organic light-emitting diode (OLED) display. Its applicability as an active drive element is hampered by the large contact resistance at the metal/MoS2 interface, which hinders the transport of carriers at the dielectric surface, which in turn considerably deteriorates the mobility. Modified switching device architecture is proposed for efficiently exploiting the high-k dielectric Al2O3 layer, which, when integrated in an active matrix, can drive the ultrathin OLED display even in dynamic folding states. 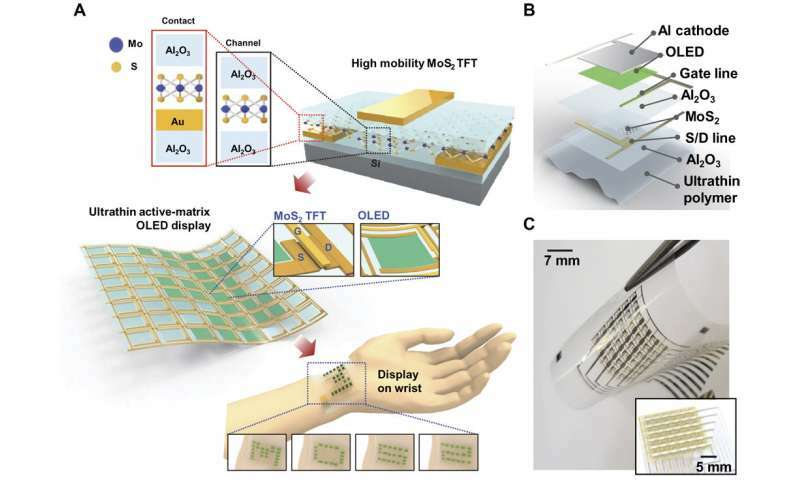 The proposed architecture exhibits 28 times increase in mobility compared to a normal back-gated thin-film transistor, and its potential as a wearable display attached to a human wrist is demonstrated.